In November 2017 I listed the albums I liked most from Gibraltar to Trieste. It had taken me fromJune to November to “travel” that journey (via Spotify, Wikipedia and Google Maps). It has taken me a bit longer to cover the second leg of the trip – Slovenia to Turkey. But I think I have found some outstanding music all the way through the Balkans. And at some point I will go back for more. Here is the playlist. 195 songs and 14 hours listening. These are my favourite albums starting in Piran on Slovenia’s Adriatic coast and ending Tunceli which is somewhere in Anatolia nearer the Black Sea than the Med. After I reach my final destination (Gibralter) I think I’ll be exploring more of this region. While my two picks are Katalena – Cvik Cvakand Pomladne Sanje – Brina Vogelnik, Janez Dovč there are other albums, and individual tracks and of course Spectre by Laibach is a splendid album and a favourite regardless of this exploration. … I will not be able to choose only 2 albums from BiH. It’s easy to know where to start. Mostar Sevdah Reunion, of course. To a degree they are one of the reasons I started on this make-believe journey. They are one of the measures I use when considering the important question “Who is the Horslips of [x]? Who is the MSR of [x]?” The live Kings of Sevdah is, of course, the first choice. You must listen to Amira Medunjanin’s Damar album. You must, must, must, must, must. Superb recording, outstanding musicianship and arrangements and a fine selection of songs. I’m torn; which album by Damir Imamović? There is a good live album and several studio recording to choose from. I could be wrong, but I’m going for Sevdah Takht. It is a bit slow to start, but gets there after the second Intro. The next “torn between” moment is between any Bozo Vreco album and Halka (Halka is Bozo Vreco as far as I can make out). In the end the choice is easy. “Haunting” is not a word I use often or lightly, but the album Pandora is all that. Utterly brilliant. BiH has a population of about 3.5 million. How can there be so much artistic talent? This is just the music. I also have a small pile of books from there to read. A couple of times I have researched a country’s music for a few days and drawn a blank – nothing to interest me, nothing to answer the question “Who is the Horslips, here?” I managed to find a few tracks in Montenegro, but nothing I want to smuggle out as a favourite album. Nothing. Nič. … was a different story. There was a band from (partly) Northern Ireland called Albania. Those were in the days when the country was a closed off secretive place – think North Korea today. Capturing the traditional sounds of Albanian music in a modern (but not modernised) context is Saz’iso. The album produced by legendary Joe Boyd (the American responsible for some of the great English folk-rock recordings from the late 1960s and 1970s) is called At Least Wave Your Handkerchief At Me. There’s Toka Incognita an album by Eda Zari which goes on the “really interesting, don’t know if I like it, but if I listened more I probably would” pile (it’s a small pile). There are more suggestions on the Albania page, among them Elina Duni who has recorded individual tracks I like, but a whole album? Not for me, thanks. 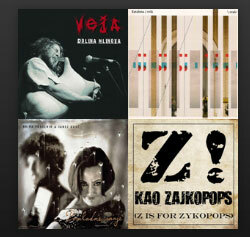 So a lot of good music from Albania – but only two albums this time. Ooops – I forgot Greece in the first draft of this – sorry Greece. One of my favourite songs on this trip Winter Is Coming by Kristi Stassinopoulou Her new album with Stathis Kalyviotis, NYN, is right up there with the best. I think I chose 4 tracks on the Greece playlist. Really love this album. really interesting (even excentric?) arrangements. I’m not sure whether you would easilly describe this as Greek – it is certinly inventive and unpredictable. Recommended. Ross Daly is an important musician in Greece and I’m adding his Music of Crete – traditional music, with no tipping of the hat to modern music – he’s not the Horslips of Greece, he’s the Chieftains of Greece. And finally for the moment anyway Daemonia Nymphe who use traditional instruments to create an extraordinary and progressive sound. Psychotasia is the album. And if you dont have time to listen to it all, just try Thracian Gaia as a taster. Of all the countries on this leg of the journey, Turkey comes up with the best music after Bosnia and Herzegovina. I’m trying to keep my ration down to two albums per country. Turkey? Not possible. Four (at least, I just stopped adding to the list – there are many more tracks here). Two great finds they are Light of Babylon – Yeni Dunya but for sheer magnetic performance find the Hinech Yafa video on YouTube (here ). Minor Empire Uprooted “Turkish psychedieica” from a Turkish band in Canada.